One of the biggest challenges in creating a sustainable lifestyle is reducing the amount of plastic we use daily. According to a report cited in this Scientific American article, plastic manufacturing has increased exponentially in this century. Because food storage is a big part of this increase, a sustainable kitchen is a great place to start. Why worry about using plastic for food storage? Substances from plastics can leach out and impact human health. It’s known that chemicals in plastics make their way into our food by coming into contact with it. The substances known as Xenoestrogens and Phthalates are easily transferred into our food from storage containers. Consumers might already be aware of the dangers of bisphenol A, or BPA in plastic. Manufacturers are now marketing BPA-free products, yet consumers should be aware that this does not mean these products are safe or sustainable. BPA is only one of perhaps hundreds of chemicals in plastic that we encounter daily. Promotes early puberty onset in boys and girls. Promotes weight gain in women and men. Accelerates hair loss in women and men. Other harmful substances hiding in plastic food storage are known as Phthalates. These are chemical compounds that are commonly added to plastics to increase their flexibility, transparency, durability and longevity. These chemicals are associated with many health problems including obesity, infertility, birth defects and even certain cancers. Don’t use plastic bags to bring produce home or to store it. Take your own cloth produce bags shopping with you. Use clean dish towels to wrap things like leafy greens when storing in the hydrator. They will keep the produce dry and allow it to breathe. Skip the plastic wrap and use sustainable beeswax wraps instead. Get rid of all plastic food storage containers and switch out for glass. There are several brands to choose from on Amazon but most have airlock lids. Simax and Anchor Hocking have small baking dishes with glass lids that we use for storage. 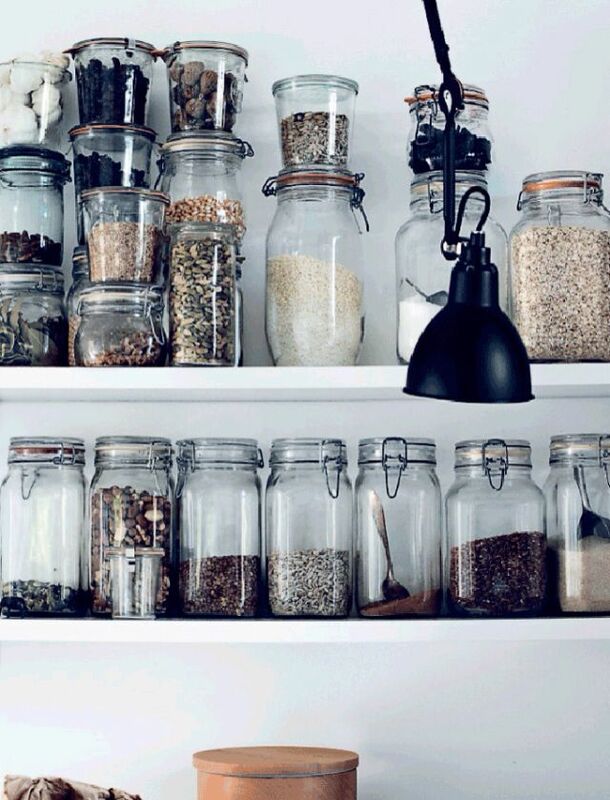 Use Mason jars for storage of bulk items. You can also use Mason jars in the freezer. Just fill it up to about ⅔ full to allow for expansion. Make your own condiments! Check out this super easy Mayonnaise recipe. Skip the plastic jug and buy your milk in glass! Most natural food markets sell brands in glass bottles that you can return for a deposit. When you buy meat and cheese, avoid grabbing the shrink wrapped kind off the shelf and go to the counter to have it custom cut. Ask for it to be wrapped in paper instead of plastic. Gradually begin cutting back on products that only come in plastic. Begin with things that seem less essential, such as chips, cookies, and most snack items. This might seem drastic at first because it includes so many things. You’ll find, however, that it not only cuts down on plastic use, but you’ll be eating more fresh, real food! You will also be saving money, which will make more room in your budget for better nutrition. Remember that shifting towards a more sustainable lifestyle is a gradual process. It will take time and adjustment in many areas of your life. Taking steps to create a sustainable kitchen by reducing harmful plastics is a good beginning!